The country covers an area of 636,000 square miles (almost nine times the size of England, three times the size of France and one-fifth the size of the entire USA) and has a population of over 70 million. Its border countries, clockwise from the north-east are; Turkmenistan (former USSR), Afghanistan, Pakistan, Iraq, Turkey, Armenia (former USSR), and Azerbaijan (former USSR). The Persian Gulf is situated along the full expanse of southern Iran, and in the north the Caspian Sea lies directly above the Alborz Mountains. Iran is an elevated plateau with an average height of over 3000 feet above sea level. The central desert plateau is surrounded by tall chains of mountains, giving it an almost bowl like shape. In the north the Alborz range creates a formidable barrier between the plateau and the fertile coastal plains along the Caspian. These mountains include several peaks of over 13,000 feet in height. The highest, Mount Damavand stands at 18,600 feet, and is an extinct volcano dominating the skyline of the capital city Tehran. 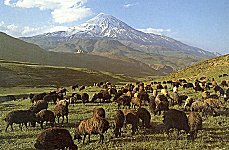 Flock of sheep on the southern foothills of Mount Damavand, Alborz mountains. The chief fertile region lies in the Caspian coastal strip, north of the Alborz Mountains. The slopes of Alborz facing the Caspian Sea, have dense forests with several botanical species representative of Tertiary flora, which have survived the ice age. There is an abundance of rhododendron, maple, hornbeam, and ivy. Today, large forest areas have been cleared for agricultural purposes. Heavy rainfall in this region during most months with a high humidity create hothouse conditions which enable crops of rice, tea, sugar, tobacco and cotton to be cultivated. Fish has traditionally been a major element in the diet of the people along the Caspian Sea, and sturgeon are fished for their caviar and meat. The sturgeon can weigh between 40 and 300 kilos according to the species. Caviar is one of Iran’s well-known export products with production estimated at around 300 tons per year. The Zagros mountains which occupy, with their foothills most of the western half of the country have several peaks over 14,000 ft. Great herds of sheep and goats move on a regular seasonal cycle from the highlands in the summer to the valleys in the winter. At present, there are approximately 45 million sheep, 25 million goats, and 5 million cows in Iran. A small number of horses are also raised in the north end of the Zagros. The natural vegetation of the Zagros Mountains is oak forests up to 7,200 feet and above that a mixture of oak and juniper. Vast stretches of primary forest have already been seriously depleted and now large parts are covered in grasses and bushes suitable for grazing. In the lower parts of Zagros wheat, barley, vines, citrus fruits and vegetables are cultivated. A settlement of Dye workers, close to Natanz in the Isfahan province. left over quantities of pigment when plastering their houses. In the centre of Iran there are two main areas of desert. The salt desert in the north is called Dasht-e Kevir, and the sand desert in the south, Dasht-e Lut. These areas are mostly uninhabited, and while there are some oases in Dasht-e Kevir, Dasht-e Lut does not support any form of life. The wide Persian Gulf coastal plain is fertile only in the north-west, around the Karun River. North of this region lie the country's chief oil fields, and refineries are located at Abadan, Tehran, Tabriz, Shiraz and Kermanshah. Iran is currently the world’s third largest exporter of oil after Saudi Arabia and Norway. Today oil-based products are its main source of revenue and account for 94% of its exports. Other minerals include; coal (Kerman and Khorasan provinces), iron ore (Bafq in Yazd province and Sirjan in Kerman province), copper (Kerman province), alumina, bauxite, zinc and lead, all of which exist in commercial quantities. The East and South East of the country are very different from central Iran. Less developed but also steeped in archaeological and historical interest. View from the top of the citadel of Bam, a huge ghost town with enclosing walls, south eastern Iran. megaton hydrogen bomb destroying much of the city and causing tragic loss of human lives in excess of 30,000. 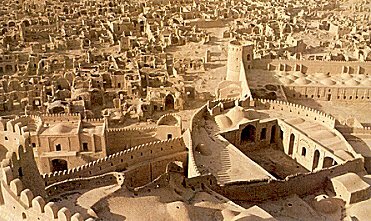 Bam had been a well-preserved medieval city in Iran and one of the largest in the world and was designated a world heritage site by UNESCO. Sistan va Bluchestan the second largest province in Iran situated in the south-east is also one of the most desolate. 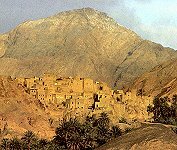 Sistan the north east pocket of the province was once a fertile agricultural area and the seat of many ancient kingdoms. Today, it is largely barren, hampered by swamps and salt lakes and prone to fierce blizzards. Baluchestan the main part of the province is exceptionally arid and inhospitable, supporting little more than a few oases growing bananas dates and limes. Khorasan, situated in the north east of Iran is the largest province and takes in the corridor between the Caspian Sea and the salt wastes of Dasht-e Kevir. 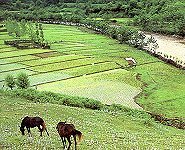 Although most of Khorosan is mountainous, there are many fertile valleys and the province produces large quantities of fruit, nuts, sugar beet, and cotton. 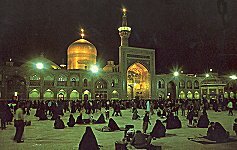 Most of this area is uninhabited; however, more than 14 million Shi’ite pilgrims visit the magnificent holy shrine of Emam Reza in Mashhad every year. Perhaps the most famous Iranian gemstone is Turquoise mined in the Khorasan province. This bluish green stone adorns many Persian jewellery settings. Iran is a country so vast, with varying climates, that for example it is possible in one day to go skiing in the mountains in the morning and sunbathe on the beach in the afternoon. Hamedan situated within the Zagros Mountains, has winter temperatures of 20o-30oC below zero, and in the summer temperatures bearly reach an average of 16o-18oC. Abadan close to the Persian Gulf, has winter temperatures of 17o-18oC, and the summer temperatures can be as high as 50oC. Spring (April - May) and Autumn (mid September - mid November) are the most pleasant seasons. Rain falls over most of the country only from October through to March, and except in the north and north-west it is generally insufficient. Due to inadequate rainfall, only 14% of the land is cultivated. About 40% of this is irrigated, and at any given time more than half the land lies fallow. Wheat (in the north-west Azerbaijan area) accounts for just over 50% of Iran's agricultural production, followed by barley (in the west Khuzestan area) and fodder crops. All manner of fruits are grown in the less arid parts of the country including; pomegranates, grapes, figs, dates, strawberries, oranges, peaches, melons, apples, and lemons. However, food production is still not sufficient to satisfy the domestic demand, and a substantial amount of food is imported. Iran’s great climatic and geographic diversity has led to the establishment of a very rich and varied fauna, which include; brown and black bear, wild bore, lynx, wolf, jackal, hyena, ibex (a type of mountain goat), gazelle, deer, mongoose and crested porcupines. Until the 1940s, tigers, lions, panthers, and leopards were hunted in Iran, but today only a small number of panthers and leopards still survive. It is also one of the most important regions in the Middle East for bird migration. The largest concentration of birds can be found in the Persian Gulf, lakes Parishan, and Arjan (Fars), the Shadegan marshes (Khuzestan), the salt lakes of Orumieh (Azerbaijan) and Bakhtegan (Fars) and the Ansali marshes (Azerbaijan). There are over 500 species of birds in Iran including the Iranian bee-eater, the yellow partridge, the falcon, the black kite, the greater flamingo, the pelican, the Socotra cromorant, the glossey ibis, the Smyrna kingfisher, the crowned and black-bellied sandgrouse, and the white-throated robin. With all its beauty and diversity, tragically Iran is susceptible to major earthquakes. There have been 943 earthquakes during the last twenty years. The most devastating in 1990 killed more than 45 thousand people in northern Iran. Experts believe that every five years Iran can suffer an earthquake with the intensity of at least 7 on the Richter scale.